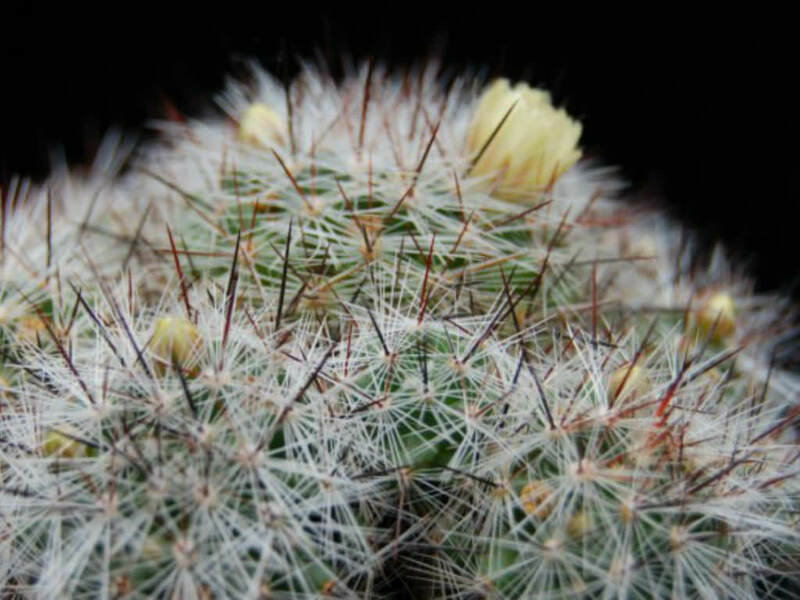 Mammillaria vetula is a small club-shaped cactus, up to 2 inches (5 cm) tall, with about 25 white, bristle-like, radial spines and 1 – 6 brownish central spines. The stem is light green in color, and up to 1.5 inches (4 cm) in diameter. Axils of tubercles are naked or sometimes with a small tuft of wool. 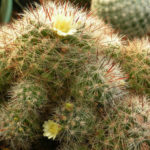 Flowers are borne at upper part of plant and up to 0.6 inch (1.5 cm) long and 05. inches (1.2 cm) in diameter. The outer perianth-segments are red with cream-yellow margins, and inner perianth-segments are cream colored. 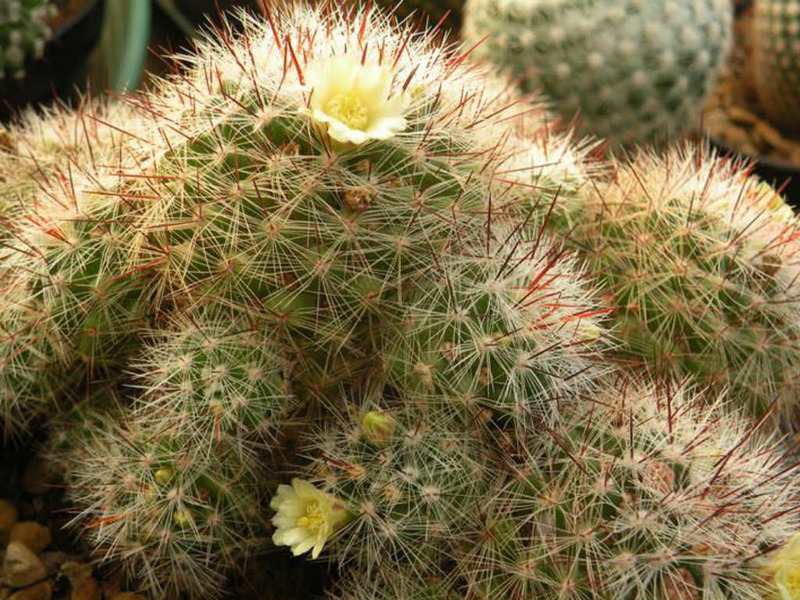 To encourage better flowering, allow the plants to enjoy a cooling period in the winter and suspend watering. 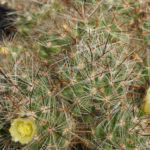 Unlike many other cacti, which use their ribs as storage devices, the Mammillaria feature raised tubercles, from which spines emerge. When you water, the tubercles will expand to allow for increased water storage. The flowers emerge from the axils of these tubercles on the previous year’s growth, which accounts for their interesting halo effect. 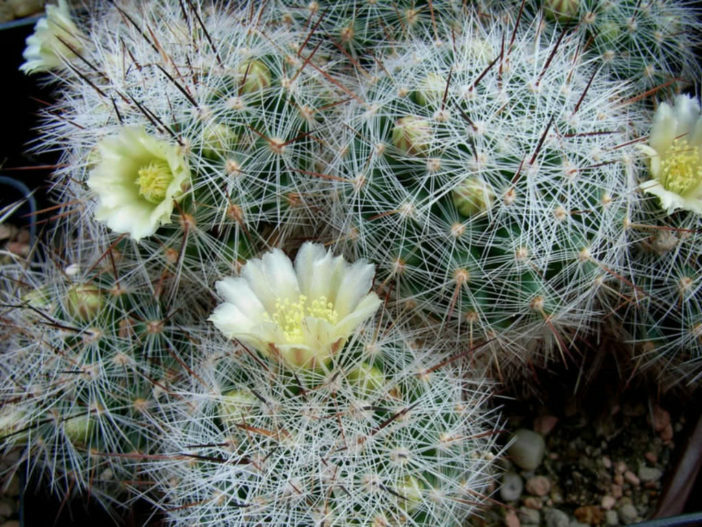 It’s imperative that the cactus is not exposed to prolonged dampness and sitting water. Never let your cactus sit in a dish of water. Lastly, make sure to fertilizer during the growing season for the best results. Repot as needed, preferably during the warm season. 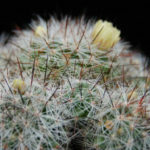 To repot a cacti, make sure the soil is dry before repotting, then gently remove the pot… – See more at: How to Grow and Care for Mammillaria. 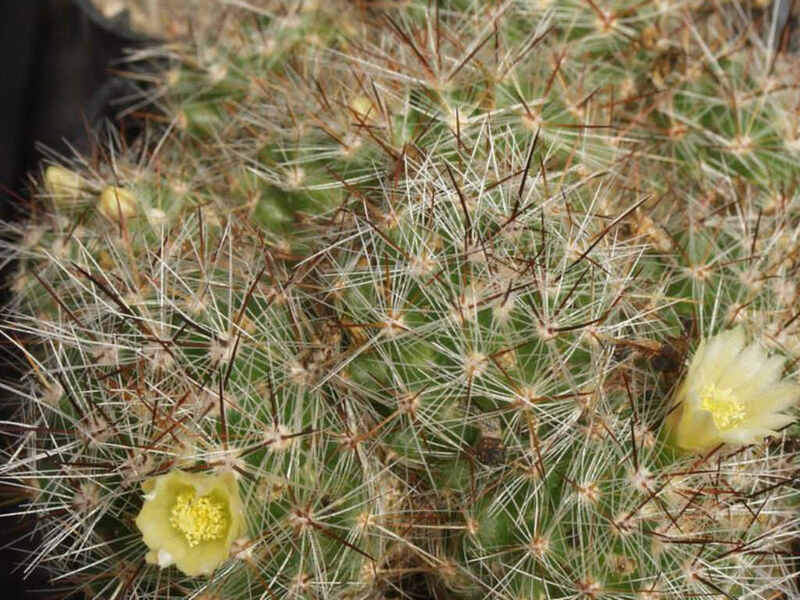 Native to Mexico (Hidalgo, Guanajuato).